The HAZARD project has compiled a rather comprehensive literature review concerning maritime and seaport safety & security relevant literature. As a result, a document index aggregating documents from various fields of study has been created. 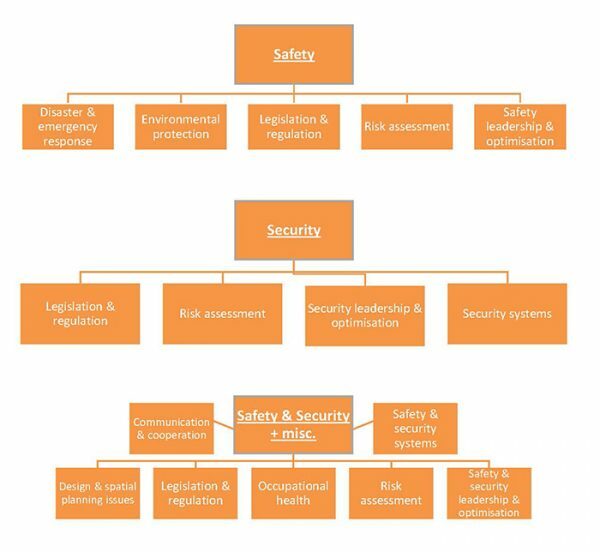 Aim of the literature review and document index was to provide Project Partners and other interested stakeholders with knowledge about currently relevant topics concerning safety & security, and serve as “food for thought” and give perspective to these issues. The process of conducting the literature review and aggregating the data into a document index was done by the Lead Partner, University of Turku. The work itself was done by research assistant Mr. Mikko Harteela. In November 2016, the index consists of 361 publications including journal articles, conference papers, books or book chapters, project briefs and alike. Main categories were then further divided into sub-categories, tier I–III. (Figure 1.). Due to great variance in collected material’s nature, the time window of the publications was set to be flexible. The main principle was that documents published earlier than 2003 would be left out from the index. However, two pre-2003 publications made it to the index due to their relevance. After consideration older publications related to fire and explosion modelling were included, whereas publications on rather time-bound cyber security and IT systems in port management were more likely left out due to the obsoleteness of the information. 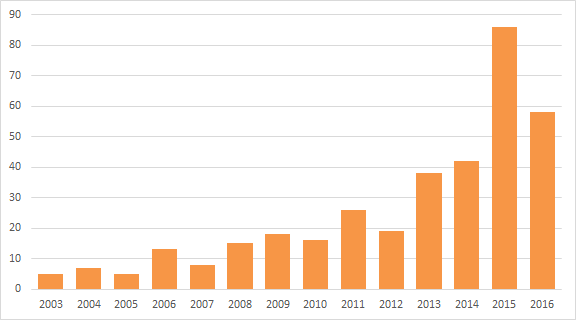 As these conditions were set and an intentional decision to emphasize more recent material was made, the distribution of the document index material accumulates heavily on publication period 2013–2016 with year 2015 being the most frequent publication year (Figure 2). Risk assessment in its various forms was by far the most popular field of research, especially in terms of safety questions, but it was also relatively popular among security-related literature. The profound effect of the terrorist attacks of 9/11 can still be seen even today. Vast amount of security-oriented documents in the index somehow concern the possibility and outcomes of terrorist attacks against United States’ maritime infrastructure. Somewhat surprisingly, the area of cyber security concerning maritime infrastructure, especially seaports, produced far less hits than anticipated. 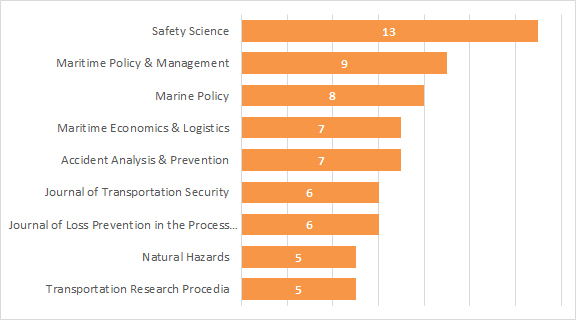 As seen from Figure 3, the most “popular” journals are associated with maritime policies, accident prevention and safety & security enhancement.